The health benefits of meditation have been known for years - from reducing stress and anxiety, to improving performance and an overall sense of well-being. But one Canadian man recently discovered another perk to practicing that ancient technique. Turns out, it comes in handy when a bear drops by to destroy your tent. And that's exactly what happened to David Weale. Last weekend, while out on a solo camping trip in the woods near his home in British Columbia, Weale was stirred from his morning meditation by the sound of approaching footsteps. "I thought, 'Could that be a bear? No, it can't be a bear,'" Weale told The Dodo. "So I sat up, and, sure enough, it was a bear." Now, it would probably be at this point that most folks might leap into a panic - but not Weale. "My rational mind kicked in. I know that black bears usually aren't dangerous," he said. "I wasn't crazy frightened, but I knew I needed to stay calm. I just stayed sitting down and facing him. I wanted to let him know I was not food." 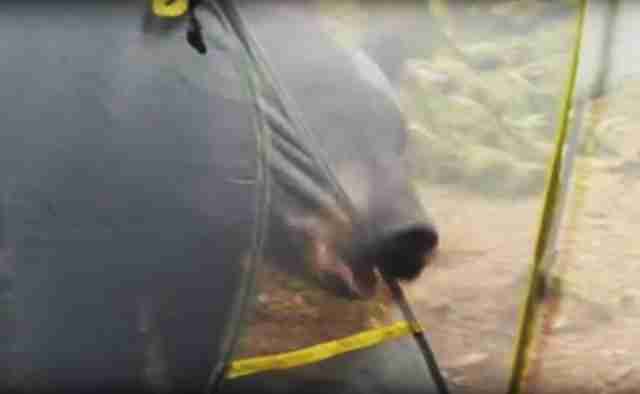 Weale managed to keep his cool enough to film the harrowing encounter, even the part where the bear snapped the rod on his tent causing it to partially collapse. Not long after, Weale thought it'd be best to move along. With the bear still in his path, however, he decided lure him off by tossing out a smoothie he'd brought along for lunch. "I know it's not a good idea to feed bears, but I needed to distract him so I could get away," he said. Fortunately, Weale managed to escape the run-in without incident, returning later to collect what was left of his tent. All in all, though, he has no hard feelings - in fact, he's grateful. "It was a very cool experience to be that close to a bear," he said. "I hope people will learn to stay calm in scary situations. Not everyone will run into a bear in their lives, but the ability to stay calm under pressure is a skill that everyone needs and can learn through meditation."